Pune  is in Maharashtra, India. It is second largest city in the state and is considered the state's cultural capital. The city contains the headquarters of an administrative division officially known as the Pune division. The large student population in the city makes for a lively nightlife and vibrant atmosphere. Pune also houses fantastic restaurants, good museums and is well known for its surrounding hill forts which offer panoramic bird's-eye views. A backside view of the Pune University Main building. Pune has a glorious history of nearly 1600 years. Pataleshwar caves (near Jangli Maharaj Road) from the 5th century is an evidence to Pune’s old settlements. Rashtrakut (राष्ट्रकुट) Kings had built a beautiful temple of Shiva called Punyeshwar, which was unfortunately destroyed during Sultan’s attack on city in 13th century. Since Pune is in the state of Maharashtra, most of the residents are ethnic Marathi. (or Maharashtrians). There is a lot to be said about Pune being called "Oxford of the East". Simply put, Pune is a bona fide, one hundred percent university town although it seems too much to call it a university city. There are colleges and institutes galore here. From engineering (COEP) to medicine (BJ), arts (FC) to science (SP), Pune has everything. And it has the single most variety of students in India; besides that, there are students from outside India. What this all means is that in Pune, you're always young. The vibrancy is tremendous; for example just stroll along Fergusson Road on a Saturday evening. It's full, crowded and thriving and extremely lively. Or go to Durga Coffee House on Paud Road near MIT College in early December or early June at about 12 midnight. You will see a massive crowd of students gulping down hot coffee in an attempt to stay awake for their examinations. The climate of Pune is quite pleasant. Pune has three distinct seasons: summer, monsoon and winter. Summers are typically hot with maximum temperatures ranging from 35 to 42°C. The warmest month in Pune is generally April as compared to the rest of the Deccan Plateau where it is May. Pune does not get very hot; even during peak summer the air is cool and even standing under a tree can give respite form the heat. However, as sunlight can be intense leading to skin tan and sun-burn, be sure to carry and use sunscreens (above SPF-30). The nights in Pune are significantly cooler than most other parts in this region owing to its high altitude. The average rainfall is approx 550mm. The city often receives local and heavy thundershowers with heavy downpours in May, which brings down the temperature. The rainy season can sometimes be gloomy, with cloud cover for days together. In winter, day temperatures can be as low as 24 - 28°C and temperatures at night as low as 5 - 8°C. Winters are generally dry. Normally, the climate in Pune is pleasant during the month of November. Tourist Info Booth, Pune City Station. Pune is a fairly cosmopolitan city. Although Marathi is the official language of the city and also the most common language spoken on the streets, most people also speak Hindi along with English. Baner The fastest developing suburb in the city is located in the western region. This area is close to Hinjewadi IT park and Shree Chatrapati Sports complex. Most convenient gateway to catch Mumbai e-way from the city. Deccan refers to the area around the Gymkhana by the same name. It is the cultural district and houses numerous theaters, art galleries and cinema halls. Shivaji Nagar has a central bus stand and rail stop. The E-Square Multiplex is located here. Camp is the area which refers to Central Pune. At the center of Camp lies Bund Garden, Pune's largest green patch. Most of the corporate offices and upmarket shopping malls are located here. B T Kawade Road is centrally located residential area located near camp (Eastern Pune). Koregaon Park is located north-east of the Camp area. It is considered to be the poshest suburb and houses the city's best restaurants. Osho Ashram is here and one finds the maximum number of foreigners here. The Peths are a cluster of little neighborhoods that constitute the old part of town. Most of the lanes in this part of the city are narrow and one can find many street vendors sell snacks on the sidewalk. Kothrud surrounds both sides of Karve Road and the adjoining Paud Road. It has the highest density of residential complexes in Pune. It houses quality restaurants as well as shopping complexes and also has many well known Schools & Engineering Colleges. Chandni Chowk located at extreme west of Kothrud hosts a number of well known restaurants and pubs - including a 24x7 cafe. The City Pride Multiplex and the Yeshwant Rao Natyagruh are located in this region. Aundh is in the north western part of Pune. It is a fast growing locality attracting IT and BPO companies. It is also the most convenient residential area for people working in Hinjewadi IT park. Pashan is in the western region of Pune and only 4 km away from the Pune University. It is an extremely beautiful and pleasant part of the town on account being surrounded by hills. The Pashan lake in this region is very beautiful - especially in rainy season. Being a pleasant, calm and quiet area, it is highly suitable for residential puposes. Pashan also houses the National Chemical Laboratory (NCL), The Defence Research and Development Organisation (DRDO), Necklace Park and the Balaji temple. Kalyani Nagar is a fairly new and upcoming area located close to Koregaon Park having a multiplex and posh residential buildings. Kharadi is an upcoming area. You can see this suburb on your left side while coming to Pune from Ahmednagar. Once a sleepy village, construction is now going on in a big way here. This area is 9 KM from the Pune railway station and about 7 KM from the airport. Zensar Technologies is in Kharadi. Viman Nagar is another part of Pune developing extremely quickly. It is mostly a residential area with a handful of good restaurants. Some IT companies have come up in this area recently due to the development of the Gigaspace IT Park.Phoenix Market City Pune ,Pune's Biggest Mall with Worlds Leading Brands and has one of best Food Courts in the city. Lohegaon is a suburb of Pune. The airport is located here. It is connected to Viman Nagar and Kalyani Nagar via the newly constructed VIP road. Hadapsar is the eastern suburb of Pune. It is a fast growing locality attracting IT and BPO companies. It is also endorsed by the world bank for its development activities. Hadapsar is connected to the central city by the Pune-Solapur Highway. Hadapsar is also famous as the excellent location for the adventures paragliding. Thousands of national and international tourists come here, every year to experience the paragliding. Mundhwa is an upcoming area. The famous Magarpatta Township is just adjoining this village. Magarpatta City is the largest IT park SEZ located in Hadapsar. It is home to companies like IBM, Amdocs, ZS Associates, Avaya, eInfochips, Cerillion, JohnDeere, 'Sybase an SAP Company', EXL Service, Aviva, EDS, Principal Finance, Mellon, Patni, Honeywell, ADP, Capsilon, Accenture,Capita, Reflexis, SAS, Teradeta, Zensar, Synechron, BNY Mellon, i|Nautix and Mphasis. Pimpri Chinchwad is an upcoming township at the outskirts of the city. It is at a distance of 18 KM from Pune railway station. A proposal to call it "New Pune" was struck down due to a large number of controversies. With its quick access to Hinjewadi (IT hub of Pune) and Talawade (upcoming IT hub of Pune), most of the IT professionals prefer to stay in this area. Also known as an automobile hub of India, as major automobile companies (e.g Tata Motors, Bajaj, General Motors, Volkswagen, Mercedes-Benz) have manufacturing plants here. Hinjewadi All Major IT companies like TCS, Wipro, Infosys offices are located in this area. Hinjewadi is MIDC area.Many other pharma company offices also there. Pune is a major transportation hub for Western Maharashtra. It serves as the gateway for the numerous hill stations in the Sahyadri Hills. Popular cab aggregator services Ola and Uber operate taxis as well as auto rickshaws in Pune, and can be used via their respective mobile apps. Pune currently does not have a civil airport to its name. All commercial air carriers operate from the military airport located at Lohegaon. Pune airport  is served by almost all domestic carriers. The number of flights is however limited since the airport is under the control of the air force. Currently, international flights operate only to Dubai. If getting a direct flight proves difficult, then taking a flight to Mumbai and then traveling by taxi or train to Pune is a feasible option. A long-distance private taxi journey should take around three hours and costs about Rs 1600. The airport is in Lohegaon, which is around 10km from the city center, and takes about 30 minutes - 1 hour to reach (depending on traffic conditions). Pune is well connected to other Indian cities by rail . A lightweight briefcase not exceeding 300 cubic cm is not included, but carries a Rs 5 surcharge. Tourists traveling between Pune and Mumbai/ Thane are advised to travel by the state government run buses (MSRTC) wherever possible. State Government has two types of Buses one AC Shivneri and other non-AC Hirkani. Private and Govt. buses cost almost the same (Rs.300 - Rs.465 ) as the private buses and they have fewer stops on the way as private buses try to pick passengers on the way. Buses run very frequently (every 15 mins) and are also punctual. You can be sure of reaching your destination within the stipulated time. Most of the private buses wait till they get enough passengers before departing - which causes a lot of delay in getting to your destination. Pune is served by three national highways (NH) and an expressway. 1) NH 4 between Mumbai in the west and Chennai in the south passes through Pune. NH 4, a part of the Golden Quadrilateral of highways connects Pune to Bangalore also. Satara, Kolhapur and Kagal all in Maharashtra are connected to Pune by NH 4. National Highway 4 runs through the villages of Shirwal, Naraspur, Hadapsar, Khadki, Tolegaon, Wadgaon, Lonavala, and Khandala within Pune district. 2) NH 9 connects Pune in Maharashtra to Vijayawada in Andhra Pradesh. Indapur, Solapur, and Umarga in Maharashtra, followed by Rajeshwar, Homnabad, and Mangalgi in Karnataka, and thereafter Zahirabad, Hyderabad, Suryapeta and Vijayawada in Andhra Pradesh are connected by NH 9 to Pune. The villages of Kambhargaon, Bhigvan, Ravangaon, Loni Kaibhor, and their within the district of Pune are connected by this highway. 3) NH 50 connects Pune to Nasik. The cities of Sangamner, Narayangaon, and Khed all in Maharashtra are connected by this highway. Chakan, Rajgurunagar, Malegaon, Mancharo, Kalamb, Narayangaon, and Aleo are the important locations on this highway between Pune and Nasik. It takes about three hours to get from Pune to Mumbai airport via the Pune-Mumbai Expressway. Both private and state owned companies (MSRTC) operate luxury buses on this route and run 24 hours service with buses departing every fifteen minutes. MSRTC buses charge approximately Rs 185 (Non AC) and Rs 320 (AC) for the journey. (The MSRTC AC buses operate between 5:30am - 12:00 am). Shared Cabs operate on the popular Pune City Station to Dadar, Mumbai route. These taxis seat 4 to 5 people and charge Rs. 300 per person using a regular car, Rs. 800 for a Fiat Premier and Rs. 1000 for an Ambassador. Cool cabs (taxis with air conditioning) are also available which charge higher. Pune Station: This bus stand (located right next to the railway station and also considered to be the main bus stand) mainly serves buses on the Mumbai route. Most services make a stop at Lonavala. Shivaji Nagar: This bus stand serves buses for Vidarbha, Konkan, Marathwada and Northern Maharashtra. A few services connect with other cities in the neighboring state of Gujarat. Buses run by Gujarat Roadways run to Vadodara, Ahmedabad, Surat, Kandla and Rajkot. The bus station is located outside the Shivaji Nagar Railway station. Swargate: This bus stand serves buses covering Western Maharashtra and Konkan Region. City buses in Pune are run by the PMPML . Although the vehicles are crowded and smoke-belching, the network is very extensive. Almost all parts of the city are connected by the PMPML city buses. Major city bus stands include Corporation, Shivaji Nagar, Swargate, Kothrud depot, Nigdi, Hadapsar, Katraj and Deccan. Shivaji Nagar is believed to be the busiest bus stand in the state of Maharashtra. The fare is calculated by distance and ranges from Rs 5 (14 US cents) to Rs 22 (40 US cents). There is also a huge army of three wheeled rickshaws. There are some prepaid rickshaw stands at Shivajinagar, Swargate Bus Depot, and Lohegaon Airport. Nevertheless, always demand that they use the meter and that they show you the sheet of paper (referred as Tariff Card) which converts the rickshaw meter readings to the actual cost in rupees. As of 15 Oct.2013 the conversion equation is : Cost = 17 (for first 1.5 km) + (reading - 1.5km)* 11, where "Cost" is the actual fare in rupees and "Reading" is the meter reading which is supposed to be Kilometers traveled. Thus a 2 on the meter is actually Rs (17 + ((2-1.5)*11) = Rs 22.5 Or a 3.50 on the meter is Rs (17+ 2*11) = Rs 39. As of December 2014, MOST auto rickshaws have a new electronic meter, whereby the tariff card is redundant. It correctly gives the kms travelled and fare in exact change. This was done after a lot of protests from autorickshaw unions, probably the only city in India to have a neat and clean metering system. Just pay what is on the meter. No need to even talk. Driver may ask for directions depending on how familiar he is with the area. All rickshaws plying in the Municipal Corporation limits are supposed to charge fare according to tariff card. Most of the times they will try to charge you a little extra but that won't be too much. You can very well argue with them based on the conversion equation stated above, and sometimes they will agree to it. Nowadays, many auto rickshaw drivers try to charge extra for long distances or very short distances, or they refuse the fare. If they realise you are not from the city, they may try to take longer routes to the destination to charge extra money from you. Outsiders and foreigners should, therefore, use their own judgment before boarding any auto rickshaw. Stick to the demand of charging by meter and refuse strongly to pay any extra amount, unless it is midnight. Autorickshaw drivers may also refuse to travel to quite a few parts of the city as per their convenience; however, this is against the law if their meter reads "on hire" in the upright position. If the sign is turned sideways, the rickshaw driver is not technically working and can refuse you. It is very common for rickshaw drivers plying between 11 PM and 6 AM to demand 1.5 times the normal rates for the journey. You are advised to get this cleared with the driver before boarding the rickshaw. It is also sometimes advisable to flag a rickshaw from the streets (if practical and possible) instead of boarding one from the stands as often, rickshaw drivers waiting in stands demand more fare. If you have complaints against auto drivers for not accepting short distance rides (or any rides), asking more meter fare, not using a meter, taking other passengers along the way, carrying more passengers than allowed capacity, stopping at bus stands or other similar complaints of serious nature, you can email or call the Road Transport Authorities at 020-22051414 or 020-27492828 (PCMC) or email [email protected] Traffic cops usually come right away to the spot to book a complaint against the driver. Commuters can also send their MMS pictures at +91 9420218338. The complaints should clearly mention all details including the auto’s registration number, the time of taking the rickshaw, details of auto fare, the distance commuted, locations, date, time, nature of complaint. If you would like to avail a rickshaw in a planned way (as against impromptu hailing one from the street) autowale.in is a reliable service. You need to indicate the source and destination point of your intended trip, and the time and place where you want the rickshaw to report. It's very much like a cab booking service, and takes the hassle out of arguing with the rickshaw drivers about the fare. This city was once known as the city of bicycles, but now it has turned into the city of motorcycles. Most traffic rules are completely ignored in Pune, since there are ten times as many two-wheelers as there are cars. Lane discipline is generally tough to follow because of this reason. The general attitude towards riding motorbikes in the city is that of total ignorance of any set forth traffic regulations along with complete disregard of one's safety (not wearing a helmet). Here people ride motorbikes as if they are riding a war horse and will generally try to overtake every vehicle in front. Minor accidents on motorbikes are common; You are advised to be careful even when your signal is green as the traffic flow from other direction generally does not stop immediately. Pune's roads might turn to horrid potholes from smooth tarmac in matter of seconds when it rains. Always be on a lookout. If you are driving a car always be careful, since motorbike riders may overtake you from left or right and cut lanes without warning. Of late, there has been an improvement by addition of a number of bicycle tracks all over. That said, if you do want to hire a two wheeler, there are two outfits who rent '2 wheels' in Pune. A 100cc Bajaj Platina will cost 200 INR a day and an automatic Honda scooter will cost 300 INR. If you are planning on day trips from Pune you would be best with the larger wheels and light weight of a motorcycle rather than a scooter. Both outfits will most likely deliver to your accommodation if you ask nicely. You can hire a two wheeler on rent in Pune online at cheap price from wheelstreet.com. They have a wide range of motorcycles like Royal Enfield, Harley Davidson, Honda Activa and much more. Also, they are providing service daily, weekly and on monthly basis. And after so many calls and MMS.RTO/police can fine them as heavily as 50rs for refusal of service. Boongg. Mr Yogesh Daga, Hinjewadi, near d Mart, Pune - 411002. you can book two wheeler on rent in pune at Boongg.com. They provide certified bikes on rent in pune at affordable rates. The Pune Suburban Railway connects Pune to Lonavala, a small town en-route to Mumbai. There is only one line with seventeen stations; a second monorail line is under consideration by the government. Here is a list of all the stations, east to west. The places of interest are listed in brackets. Italics indicate the various modes of transport available at the destination station. Though there is a lot of traffic in Pune you can't compare it to Cairo or Kolkata. Majority of the vehicle are two wheelers and apart from the peak hours the roads in Pune are sparsely filled. There are quite a few car rental agencies in Pune. Most of them charge around Rs 2500 a day for a mid-size car. There are extra charges for distances above 100 km. ZoomCar and Drivezy have recently launched their self-drive car rental service in Pune, and they are already operating in Bangalore. You can book self-drive car i.e without driver for an hour or for a full day or a week. These days there are several self-drive car rental service providers. Pune, being a city of youngsters, mostly college going crowd, has a huge demand for cab services. With the introduction of online cab services taxi problems have been diminished to a bare minimum. Anyone with a phone can book a cab anytime of the day using Online method or calling on their customer care number. The user gets the cab within 15 to 20 mins of booking. Using above-mentioned cab services is definitely the most comfortable, safe and reliable option for travelling in and around Pune. The prices might range between Rs 7/Km to Rs 20/km depending upon the cab model you choose and the time of the day. Pune is the cultural capital of Maharashtra. The Marathi film industry is also based here. Raja Dinkar Kelkar Museum- The museum is housed in a Rajasthani style building situated close to the hustle and bustle of the busy Bajirao Road. It holds a collection of the most fascinating Indian arts and crafts that you would have ever seen. Mastani Mahal which was brought and erected as it was from its original form is a masterpiece amongst it’s other exhibits. It has 36 sections which include carved palace and temple doors, 2,000 year old pottery, traditional Indian lamps and 17th century paintings. Cost: 200₹ for foreigner. 50₹ for Indian national. Darshan Museum,- This museum is actually a light and sound show incorporating unique 3D holographic technologies, based on the life of Sadhu Vaswani. It's a 100 minute show that takes you through the saint's life story via different sets where the story unfolds. Encompassing universal wisdom from his life, this show is a technological marvel and artistical treat. It uses probably the only implementation of Pepper's Ghost in the country to create real to life 3D where the set is real but the people who enact the scene are projections of light. Apart from the technology, the museum houses a huge spectrum of artwork that's used to build the sets that are a treat to see. A place for the entire family, the Darshan Museum is a must visit for anyone visiting the city. It is located close to the Pune Railway Station at Sadhu Vaswani Chowk. Tribal Museum - Located off Koregaon Road to the east of Pune City Stn, this unique museum houses interesting artifacts from the Sahyadri and Gondhwa regions of Maharashtra. Mahatma Phule Museum - You can see various industrial products, agricultural and handicraft articles in this museum, which was established in 1890. It is situated on Ghole Road, in Shivaji Nagar. National War Museum - The idea of the National War Memorial was first put forth in 1996. The citizens of Pune, under the sponsorship of the Express Citizens' Forum, set up the War Memorial fund. The committee asked the citizens of the city to contribute to the fund. From the ordinary common citizen to the big corporates, everyone decided to contribute whole-heartedly for the museum. The Foundation was laid in November 1997 and inaugurated in October 1998. The memorial is a 25-foot stone pillar. Shaniwar Wada,  - This palace was built by the successors of Shivaji, the Peshwas in 1736. A massive fire destroyed the building in 1827. Most of the palace interiors also got destroyed and all that remains is the old fortified wall. But of course the impressive brass studded gates and lotus pools have also withstood the ravages of time. This palace is situated in the heart of the city next to Deccan Gymkhana, Shivajinagar, and Laxmi Road. It has become the symbol of Pune culture. There is an impressive 'Light & Sound Show' in three languages (Marathi, Hindi and English) every evening at the wada. It details the history of the Maratha empire and the significance of the Shaniwar wada in that history. Cost: 200₹ for foreigner. 15₹ for Indian national. Vishrambaug Wada - The remains of this palace stand in the heart of the old city. It was built during the 18th century by a descendant of Shivaji the Peshwa. It is well known for its elaborate wooden facade. Saras Baug - A Ganesh Temple stands in the middle of the garden in lake. It was built by Peshwa Bajirao II. Aga Khan Palace,  - A gracious building having Italian arches, salons, suites and spacious lawns. The place is a historical landmark. During the 1942 Quit India Movement, the British interned Mahatma Gandhi and his wife Kasturba Gandhi here. The palace belonged to Aga Khan, prince and head of Khoja sect who later donated the palace in order to erect a memorial, in the memory of Mahatma Gandhi and his wife Kasturba (who died in this palace). Must see is a photographic exhibition of various epochs in the freedom movement. You can see very rare B&W photos as well as paintings. The place is full of tranquility and solace. Also, visit Samadhi of Kasturba Gandhi which is in the backyard. Parvati Hill temples - Standing atop this hillock you get a vertical glimpse of Pune. A steep flight of 108 narrow steps leads to the hill top temple built by Balaji Baji Rao. ‘Nagarkjana’ drum house is the imposing temple of Parvati and Devdeveshwar. This was once the private shrine of the Peshwas. It is also the final resting place of Nana Saheb Peshwa. The Parvati museum houses portraits of Peshwas, old manuscripts, coins etc. Pune University, . The site of Poona University, stately mansions at Ganeshkhind built in Italian-Gothic style was the official residence of the Governor of Mumbai during the monsoon season. The 300m high tower beckons to all these who come here in the pursuit of higher education. It is one of the oldest universities of India. Fergusson College, . Built in 1885, the College has a beautiful tree-lined campus with smooth rolling hills in the background. 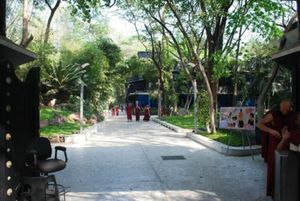 MAEER’s MIT Vishwashanti Gurukul Schoolsthis college is known for it's well trained teachers and also for huge campus. Mit railway engineering college mit railway engineering college is one and only railway engineering college in pune. this college is known for its practical education and teaching. INFINI Solution INFINI Solution is one of the renowned construction management institute in pune who delivers job-oriented Training for construction management courses after Civil Engineering in Pune. Katraj - A famous Jain Temple and a Snake Park are located here. Chatushrungi Mata Temple,  - Senapati Bapat Road. Pataleshwar Caves,  - This 8th-century rock cut temple is hidden in the heart of the city, in the midst of modern high rise structures and developments, at Shivajinagar. Reminiscent of Ellora, the temple has been carved out of a single boulder of awe inspiring size which includes massive pillars, a Shiva shrine and a Nandi bull. The temple is used by worshippers even today. Bund Garden - This garden is also known as the Mahatma Gandhi Udyan. It was built by Sir Jamshedji Jeejeebhoy, on the right bank of the Mula-Mutha to provide the poor with water during summer. The main attraction here is the evening boat rides, horse rides etc. The garden is famous for Bhel-Puri and Pani-Puri. It is situated on the Airport road and very close to the Camp area. Sinhagad and Khadakwasala,  - This is a fort nearby which is a beautiful place to see. This is also a historic place in King Shivaji era. Khadakwasala has a dam and this place is famous for natural beauty around. A lot of folks flock here during rainy season. Bhimshankar Wildlife Sanctuary: It was declared a wildlife sanctuary in 1974 and situated at an altitude of 2100 feet to 3800 feet, spread over three districts of Pune, Raigad and Thane. Bhimashankar wildlife’s vegetation comprises of semi-evergreen forests as well as western tropical hill forests. Two major Tributaries of Krishna River named Bhim and Ghod, originate from this area. Pune Music Cultural Centre, 459/1, Sadashiv Peth. Fortune Art Gallery, 86/1, Erandwana, Deccan Gymkhana. Baneshwar, Pune-Satara Rd. A favorite picnicking spot. Chateau Indage Winery, Narayangaon. A pleasant 80 km drive through toll roads and ghats. The Chateau has a good restaurant as well. Shirdi, Pune-Nashik Highway. Shirdi famous for Sai baba temple. Also residence of Sai baba. Diveagar is among the few beaches of Konkan. It is approximately 180 kms away from Pune. It takes around 5 hours to reach there. This is a very beautiful beach. It is a small village surrounded by greenery. It is better to go for two days (one night stay). Good veg and non-veg food are available. Malshej Ghat: Malshej Ghat is among the most popular outing spot from Pune. This place is located amidst the Sahyadri Hills. This place is popular among the local as well as other tourists. It is a perfect place for nature lovers, where they can spend their holidays. Malshej Ghat is one of the beautiful Hill stations of Maharashtra. There are many beautiful locations and some beautiful waterfalls which tourists to fall in love with this place. Rajmachi Rajmachi (Udhewadi) is a small village in the rugged mountains of Sahyadri in India. There are two forts which were built by Shivaji Emperor during the 17th century. It is a famous spot for trekking. It is about 15 km trekking distance from Lonavla. Rajmachi can be reached by 2 ways, the tough route from Kondivade village near Karjat and the other easy but long way route from Lonavala. In rainy season this place is filled with giant waterfalls and greenery. Gliding Centre Pune, . Go for a joy ride in a glider and experience flying like a bird. Get an aerial view of Pune at a very nominal cost of Rs 187 only. You can also learn to fly gliders at the Gliding Centre, which is India's oldest and till date the most active hub for gliding. The center is located at Hadapsar on the eastern side of the city. Flying activity is conducted from Sunday through Thursday. Paragliding School & Flying Club, . Located an hrs drive from Pune at Kamshet Learn to paraglide with Nirvana India's oldest and largest residential paragliding school. Flying activity is on from October - June. Shikara ride in Pune  Based within the city, Bluebay water sports offers water sports activity including shikara rides. Panshet Water Park At a nearby dam, the tourism department has setup a water sports park. Horse riding and go out for horse treks with Digvijay Pratishthan . Bird Watching:Tourists can enjoy boating and bird viewing in some of the city parks of Pune. 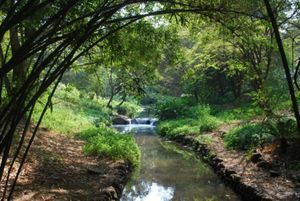 Migratory parks can be viewed throughout the year in Pune. If tourists can make it on the right time they can view many migrated birds in the parks. Trekking: Bhimashankar wildlife sanctuary in Pune, offers a thrilling and amazing trekking experience for the nature lovers. This wildlife sanctuary has two trekking trails available Seedi Ghat and Ganpati Ghat, out of these two Ganpati ghats is a longer and less dangerous trekking path. Pune has a full calendar of events, ranging from Classical Music to Rock Concerts. However, Pune's most famous festival is the Pune Festival, which is held during the Ganesha Mahotsav. The Ganesh Mahotsav initiated by Lokmanya Bal Gangadhar Tilak, today is celebrated with great enthusiasm, as city interiors almost remain blocked for ten days. Pune has more than 2000 mandals with Dagdusheth Halwai being the biggest and most famous one. Sawai Gandharva, which started back in the 1960s, has had every Indian and international artist perform and has given rise to a number of budding ones too. It is held in the months of December from dawn to dusk over three days. The Osho Festival is another international crowd puller in Pune. Held in the Osho Aashram in Koregaon Park, disciples and followers of Bhagwaan Rajneesh make it a point to attend this festival. The Chaturshringi Fair is an annual event. It is held overnight on Navratri at Senapati Bapat Road. Giant-wheels are the main attractions but the food sold at the stalls is delicious too. The Pune International Film Festival  - takes place annually and attracts some splendid films from around the world. This festival which generally takes place in January, lasts for a week and is a treat for film lovers in the city. The "NH-7 Music Festival" is a recent addition to the numerous festivals in Pune. It is held in October/November each year and features indie music and upcoming music bands and artists from all over India and some from abroad too. The festival is a mecca for music lovers from nearby Mumbai, Pune and Western Maharashtra. Over 10,000 Music lovers were at this show in Oct 2013. A number of College festivals have become very commercialised, but still attract big crowds and a very high degree of competition from colleges all over Pune. Verve organised by Express Youth Forum is the biggest inter-collegiate cultural festival in India while Concepts organized by the Pune Institute of Computer Technology (PICT) is a very popular engineering (technical) event. So all year round, there is enough excitement to keep Puneites and tourists on their toes! Silver Centrre by Sangeeta Boochra,  located at ‘’’inside Cottons - shop no. 1 opposite axis bank , koregaon park , Pune ( Mob : +91-98207-66636 ) , is a govt approved Jeweller for generations - designer Sangeeta Boochra is the leading jewellery designer of the country. Oldest Jewellery brand in Silver Jewellery. Here you will find exquisite jewellery for all age groups, they do tribal, traditional and contemporary jewellery which has the essence of India . The brand continuously work towards the upliftment of the Indian Artisans and Kaarigars who work in the villages and do not have a platform to showcase their work. They have tribal Jewellery from Rajasthan , Madhya Pradesh , Gujrat , Tamil Nadu , Kashmir etc . The designer gives her own design signature to all the pieces. A must recommended place to buy jewellery when in India. The prices are affordable and an air-conditioned shop with english speaking staff. The quality of items is quite good. You can pay with credit cards. The brand is from Johari Bazar Jaipur and is more then 119 years old. Laxminarayan Best Chiwda they are famous for their rice flakes chiwda, cornflakes chiwda, potato chiwda, Chitales's Bakarwadi and Mango Barfi. Pune is a city where you will find an excellent range of street-side shops as well as a few outstanding malls. Pune is a good place to pick up some Indian slippers made of rubber. Kolhapuri chappals can also be bought off the pavement. They tend to be soft and comfortable, and are manufactured in the Maharashtrian town of Kolhapur a few hundred miles south of Pune. All the places listed here are places where you can bargain hard and get some good stuff off the pavement for rock-bottom prices. M.G. Road. Any items such as shoes, clothing, pots, pans, electronics, stationary, furniture, kitchen sinks etc. can be found at Mahatma Gandhi Road, known to locals simply as M.G. Road. Laxmi Road. A huge market selling gold jewelry and clothes. Tulshi Baug. Located on the Bajirao Road, near Maharashtra Bank. It is a must visit and also a favourite middle-class family market. Very cheap ladies garments, footwear and other items required for daily use are available at low prices. Fashion Street. Located in the Pune Camp Area near M.G. Road. A special market where you can easily bargain your way to lots of inexpensive readymade garments, footwear, leather items and fashion accessories. Juna Bazar. Located near the Pune Railway Station (en route to the Pune Municipal Corporation). The market is held every Wednesday and Sunday on the street. It is sort of a flea market and you could get your hands on a variety of interesting objects for throw-away prices including old rare coins, gramophone records and other such unique paraphernalia. Hongkong Lane. Located in Deccan near the Garware Bridge,the lane has a blink-and-you-will-miss-it entrance. You will be surprised to find all that this tiny lane has to offer, including some very good bargains on bags, clothes, accessories, books and footwear. Vishram Baug Wada, there is a shop inside Vishram baug wada where you get variety of decorative as well as daily use items. the highlight of this shop is all the goods are created by small groups of women (Mahila Bachat Gata). Most of the items are handmade and exclusive variety. We must support such groups of women who are fighting against all odds to become independent. Koregaon Park, One of the several boutiques on North Main Road and its by lanes in Koregaon Park. These are small exclusive boutiques and have a good collection, so expect to pay for your clothes, but you may find the occasional great bargain. Puneites are crazy about books. This shows in the number of excellent bookshops scattered throughout the city. The area is known as 'Appa Balwant Chowk' is famous for various big and small book shops. Some of them specialize in special subjects like Law books, management books, religious books, computer books, music books etc. Ajit Law Book Depot , Appa Balwant Chowk. The Crossword chain of bookshops has 8 branches in Pune. The WORD bookshop, Boottee St, Camp. Book World, Basement, Sagar Arcade, FC Road. Book Space, 593, Ganesh Peth. Landmark , SGS Mall, Molendina Rd. Manney's Book Centre, Molendina Rd, Pune Camp Area. Popular Book Shop, Deccan Gymkhana. Utkarsh Book Depot, Deccan Gymkhana, Near Garware Bridge. Pune is a technology hub and is home to IT/ITES/BPO professionals. Pune also has one of the highest densities of engineers and management graduates pursuing studies. Sony World, House of Laptops, Croma are electronics chains dishing out the goodies. Being a student town, Pune has a good selection of mid priced hair salons. Pune is undoubtedly a great place to eat. Fergusson College Road is full of budget eateries serving delicious hot food at nominal charges. For a range of multi-cuisine restaurants, visit ABC Farms, Koregaon Park, which houses the city's best restaurants. Almost all restaurants open and close at similar hours. 10 in the morning to 11 at night is usual. Of course, restaurant bars stay open till at least midnight. Misals is a Pune favorite, if you can stomach the spice in them. They are a tasty meal and a visit to Bedekar Misal or Shree Uphar Gruha is a must. They are located in the Peth areas and are famous. Shree Uphar Gruha is located at Tulsi Baug. It's a small joint but dishes out tasty Misal and fritters. For variety, head out to Koregaon Park. North Main Road is a lane with more than 50 restaurants. It offers a choice of cuisine including Italian, French, Mexican, Thai, Japanese and a variety of local Indian food; there is a restaurant to fit every taste and mood. ABC farms in Koregaon Park has many restaurants at one place - ideal when you cannot decide before leaving for dinner. Koregaon Park is known as The Restaurant Suburb, and holds a similar status to Pune that Bandra holds to Mumbai. Chitale Bandhu Mithaiwale outlets in the city are also a must go for a variety of sweetmeats and snack items. The Gulabjamun with sprinkled sugar which is a dessert dish and the famous Bakarwadi which is a fried chickpea flour preparation, are something worth trying while visiting Pune. Good Luck Cafe,Good Luck Chowk(Square), F.C Road. One of the oldest and among the most popular resturants in Pune, it serves Iranian/Punjabi dishes, but is well know for its tea and butter bread. mostly frequanted by collegians it's a cool place to hang out. Vohuman, 34, Sassoon Rd. An awesome Iranian place serving delicious omelettes. Good for breakfast. Right next to the Jehangir Hospital. Chaitanya(vegetarian)/Tawas and Tandoors(non-vegetarian) at F.C. Road. Serves quite cheap stuffed parathas(layered chapattis), rice.Has combos of chicken/mutton/fish curries and dal(lentils)+parathas;biryanis;tandoor snacks on offer at very reasonable prices. Delhi Kitchen,Near Kotbagi Hospital,Aundh/Deep Bungalow Chowk. Serves cheap and delightful punjabi food.Curries available in different serving sizes;a 'quarter' curry being sufficient for one person. Manmeet Chat Center, On east side of F.C. Road next to Subway and opposite F.C. College Junior wing entrance, near Sant Tukaram Chouk. Tel: 64001088. Delicious chat. 'Popular basket chat' is INR 50 and is a tasty filling meal or great for sharing. The 'extra special' costs INR 5 more. Ande Ka Funda, Paud road. The only place for eggetarian. Serves 26 egg items. Vaishali, 1218/1, Shivaji Nagar, Fergusson College Rd. A popular youth joint serving amazing South Indian dishes. Their Sambhar is arguably the best in the City. Wadeshwar, Fergusson College Rd. Another popular eating place. The best fast food you will get here includes appe, vada-sambhar, and pav bhaji. Another branch of wadeshwar is also there on Bajirao road, Shukrawar peth, which serves very good idlis and uttapa, and alu paratha.worth a try. Baan Thai Bakers Point, NIBM Road.Pretty good variety of Prawns and Chicken preparations. Marzorin, Main Street, Camp. Famous for sandwiches, cakes and pastries. Top in TownGarvare Bridge, Behind Chitale Opp Deccan Gymkhana. Amazing non-veg food items. Do not miss fish and Chicken here. JJ Garden Vada PavMG Road, Camp. Serves one of the best Vada Pav with green chutney. A must have when you are in Pune. Godbole's Suswaram Kothrud, near bedekar Ganapati. Very good maharashtrian snaks like Khichadi, pohe, vada pav, sheera. Also serves very good lunch. 'Bapat Upahar Gruha, Near Raja kelkar Museum. Excellent Maharashtrian Food and very affordable. 'Steamy affair, JM Rd (between Balgandharv and Deccan Bus stand). Serves steam idli, fried idli, veg idli, corn idli, kutti idli, pepper idli and dahi idli among the 15 different varieties. The speciality is the varaya idli which is served exclusively on Thursdays and Saturdays for people who observe fast. Another unique type of idli served here is the kadhi idli. Spicy chutneys served along with these sumptuous snacks make the dish even more interesting. All the idlis are Rs 12-22. 'Just Baked, Dhole Patil Road (Bund Garden area), is a proper bakery. Serving traditional English loaves, decent sourdough cobbs, french baguettes, brownies, moist chocolate-fudge cupcakes, veg and non-veg sandwiches and rolls, pizza buns, cakes and a REALLY nice vegie burger (~60-70rupees). Also has a tiny upstairs seating area if you want to have some drinks and what-not. Definitely a place to check out, and to escape from the spongey and overly sweet bread you usually have to put up with in India/Asia. Satguru Punjabi Rasoi Best North Indian Food in Pune located on Viman Nagar Chowk opposite Giga Space IT park. 2kms from Koregaon Park on Nagar Road. Try it good place hangout in eveinings and night. Also located at Destination Center,Magarpatta City,Hadapsar. Manmeet Chat Center, On east side of F.C. Road next to Subway and opposite F.C. College Junior wing entrance, near Sant Tukaram Chouk. Tel: 64001088. Delicious chat. 'Popular basket chat' is INR 50 and is a tasty filling meal or great for sharing. The 'extra special'costs INR 5 more. Ande Ka Funda, Paud road. The only place for eggeterian. Serves 26 egg items. The Green Villa Perched in Lane-C, Koregaon Park, this is an Arabic themed restaurant quite popular with the youth and foreigners. They serve authentic Mughlai and Lebanese food along with Hookah. Wadeshwar, Fergusson College Rd. Another popular eating place. The best fast food you will get here inlcludes appe, vada-sambhar, and pav bhaji. Another branch of wadeshwar is also there on Bajirao road, Shukrawar peth, which serves very good idlis and uttapa, and alu paratha.worth a try. Kayani Bakery, East St. Famous for its Shrewsbury biscuits, Walnut Cake and Sponge Cake, many mouth watering bakery items here disappear almost instantly over the counter. Asha Dining Hall, Apte Road. Good Marathi thali at a very reasonable price and a clean dining place. Burger King has two branches and serves brilliant grilled sandwiches. Their 'King Burger' is huge, good to eat and make for a very inexpensive, sumptuous meal. However, this is not related to the international chain. near ABC tower,(kalyani nagar bridge), Koregaon Park. Suyog Plaza, Shivaji Nagar, Deccan Gymkhana. INOX Multiplex, Bund Garden Rd, Camp. Marigold Complex, Survey 15, Wadgaon Sheri, Kalyani Nagar. Survey 127, Karve Rd, Kothrud. Sharvaree / Shabree. 1199/1A FC Road. 411004, Pune (corner of FC Road and Ghole Road). Phone: +91 20 25531511. . Sharvaree is upstairs and famous for traditional Maharashtrian 'thalipeeth', a savoury multigrain pancake snack. Downstairs is Shabree which is multicuisine but specialises in Maharashtrian thali (INR 150). The food is good and the restaurant is very clean and pleasant. Janaseva Garvare Brigde, behind Chitale. Traditional Maharashtrian Thali, very famous and visited by many maharashtrians visiting Pune. Vasu Vada PavBhel Chowk, Pradhikaran. Serves one of the best Vada Pav. A must have when you are in Pimpri Chinchwad. Sukanta ,Near Deccan just near to Z bridge is famous for Thali. The food is very tasty. Asian Melange , Near Karve Statue, close to the Kothrud Bus Stand. Serves delicious veg and non-veg Indian food. One can also order other Asian delicacies viz. Chinese and Malaysian food. The place has a barbeque grill bar on the rooftop operational only in the Summer. More places. Barberque Nation, Kalyani Nagar. Offers a vast & Delicious variety of concept dining menu for around 800 bucks only. Really worth paying for, specially for the unlimited servings of Prawns, Crabs, Chicken, Mutton, Fish and also equally delicious Veg food. Good 8-10 variety of desserts to finish your meal. Flags, INOX Multiplex, Bund Garden Rd, Camp. Has a very interesting menu. Kabab Factory package, Package comes in both Veg and Non-Veg formats costing Rs. 325 (approx $7.36) and Rs. 375 (approx $8.50) + taxes, respectively. Package include unlimited delicious kababs (6-7 different types), Roti, Dal, Biryani and desserts (4-5 different types to choose from) every item listed is unlimited. La Dolce Vita, City Point, Dhole Patil Rd. Serves authentic cuisine from Tuscan, Italy. The menu has an extensive list of Italian wines. La Pizzeria, 361/5, Bund Garden Rd, Camp. Newly opened Opp E-Square in Hotel Srimaan. Tel. (020) 26133535; (020) 40077000. Has amazing Italian cuisine, pizzas and garlic bread, and it is run by an Italian. Has a fine-dining ambience. Le Meridien, Mill Rd. Pune's most luxurious hotel offers numerous dining options. Malaka Spice, Koregaon Park. Lip smacking Continental food. Nisarg, Nal Stop Junction, Off karve Road, Erandwane serves excellent Malvan/Goan style Sea Food specially crabs & lobsters. Oh Calcutta, City Point, Dhole Patil Rd. Continental fare. Pizza Express, Sohrab Hall, RBM Cannaught Rd. You must try the delicious chocolate fudge. Although it is rather expensive compared to Domino's or Pizza Corner, the pizzas are extremely authentic. Pizza Hut, at Jangli Maharaj Road, M G Road, and several other outlets. The world-famous pizza chain. Plot 403, Unit 7, ICC Tech Park, Senapati Bapat Rd. Sigree, City Point, Dhole Patil Rd,delicious food.worth having buffet of 350 bucks. Spice Island serves North Indian cuisine and is ideal for fine dining. There is a live band in the evenings. Taj Blue Diamond, 11, Koregaon Rd, Koregaon Park. This Taj hotel has three restaurants and a bar. The Orient, Sun n Sand, NH 4. Serves authentic Chinese food in a laid-back atmosphere with soft music in the background. Quite similar to the Whispering Bamboo in the Taj. The Yellow Chilli. Sanskriti Lifestyle Complex, Lane No. 7, Koregaon Park, Pune. Phone: 41285454, 41285757. Celebrity chef Sanjeev Kapoor dishes up a wide variety of interpretations of Maharashtrian and northern Indian cuisines. Choose between the outside veranda with a bar-b-q buffet, or venture into the stylish modern interior for a la carte. The choc chip kulfi is listed as a must try - this is no exaggeration! Sayaji. : On Pune Mumbai highway near Wakad. Good buffet. Refreshing Indian drinks such as Jal Jeera (a cumin seed drink) and Nimbu Pani (lemon water/soda) are sold on the sidewalk for around Rs 5 per glass. Alcohol is easily available all over town, though most of the bars are in Koregaon Park and upmarket areas. Most bars open in the afternoon and close an hour or two after midnight. Apache - The Livid Lounge, F.C. Road and Banjara Hills, Chandani Chowk. One rocking place. Good heavy music. Recommended for a rock/ metal head. Carzonrent, ABC Farms, Koregaon Park. The Easy Bar, Taj Blue Diamond, 11, Koregaon Rd, Koregaon Park. Club Nirvana, INOX Multiplex, Bund Garden Rd, Camp. Elysium Koregaon Park, (Mind Circus Innovations project). Entresol Bar, Le Meridien, Mill Rd. Hi Tide, Sagar Plaza, 1, Bund Garden Rd. Olas, ABC Farms, Koregaon Park. Provogue Lounge Lounge, ABC Farms, Koregaon Park. Pub Carousel, Holiday Inn, 262, Bund Garden Rd. Roof Top Bar, Le Meridien, Mill Rd. Scream - The Club, Le Meridien, Mill Rd. Soul Purpose at Deccan Rendezvous (See ‘Sleep’ for details). Extremely subdued lighting would make this a good place for an illicit rendezvous. Clientele are a mix of business travellers and dining guests. Open 12 noon to 3 pm & 7 pm to 11.30 pm. Ten Downing Street, Gera Plaza, Dhole Patil Rd. Thousand Oaks, 2/17, East St, Camp. Until 11.15pm. Wondurr Bar, ABC Farms, Koregaon Park. Shailaja, JM Road, wonderful food like Surmai and Crab. Place for serious drinkers. Place has been around for 50 years. There is no lack of coffee shops in the city. Some of the restaurants listed below serve good coffee, or head to a branch of the Barista  or Cafe Coffee Day  chains, both of which have numerous locations around town. The FC Road and MG Road branches of Barista are wi-fi hotspots. Dorabji is famous for coffee and it's products, Don't forget to enjoy bun-maska (bread with butter) with Irani tea at Goodluck on FC road. Juice World, M.G. Rd/ East St. Serves wonderful parathas and pav bhaji. Coffee House, M.G. Rd. Enjoy their Channa Bhathura. Cafe Good Luck End of FC Road, Good Luck Chowk. Oldest Iraninan restaurent. Famous for Bread items and Mutton Kheema. If you are looking for budget accommodation in Pune as someone outside India you may run into difficulty, especially if you are a backpacker with and/or long hair. Many lodges under 800Rs will not allow foreigners, this is claimed to be a law but this is not true, however you will hear many hotel owners speak of nightly police searches or that Indian rooms are just "not compatible" with Westerners. This bigotry be traced back to the 1970s when many Rajneeshi would stay in cheap guesthouses and disappear without payment. Try to arrange accommodation in advance, splash out or stay elsewhere. Trimurti Lodge, Fergusson College Rd. It's not particularly clean. Shreyas Hotel, Apte Road. Basic facilities. Suyash Lodge,Tilak Road. Very cheap, but almost basic facilities. Yatri Lodge, Karve Road. Clean but basic facilities. IBIS Pune: The second Accor Hotel in India, i.e. at Pune, Maharashtra - The IBIS Pune has been opened on 03rd of November 2009 which is located hardly five minutes from Pune International Airport which is a central area home to major industrial companies. The hotel is offering around 175 comfortable rooms, each with a modern fit out including a flatscreen TV and free Internet and Wifi access. It is an ideal location for business travellers as well as those exploring Pune and none the less educational institutions. It also has flexible meeting rooms, world class restaurant and exotic Hub Bar. A must for the budget conscious!! It is located at Survey 32 Nagar Road, Maharashtra State, Pune, Maharashtra 411014 with contacts 020 4018 4018/19. Pune has a small but good range of top-end hotels. Prices are generally more than those in the US. A double room tends to be priced at USD 200 to 400 per night. During the lean season, good discounts are available. There are many spots near Pune in which you can go for camping. Camping can be done safely on spots such as Lonavala, Tungarli Lake,Valvan Lake, Rajmachi ,Mahableshwar, Panchgani,Kashid & Phansad. Rappelling,Lake Crossing,Adventure Sports,paint ball in Jungle setup. One can contact many groups around Pune and Mumbai for camping activities. Pune is in close proximity to hill stations, beaches and jungles. Places like Matheran, Lonavala, Alibaug, Khandala Panchgani and Mahabaleshwar are some of the destinations which can be done over a weekend. There are several companies that connect all of these places with individual travelers and corporate travelers from Mumbai. This round trip takes in some of the interesting hill forts around Pune. Total distance is about 220km and will take 6 hours just to drive the loop, with lunch and sightseeing added on. The full trip could take up to 12 hours so leave a full day. It is suggested that this trip is undertaken either by motorcycle or 4WD due to the state of some of the roads that are encountered. It is possible to make the journey in a regular car (and many do - even auto ricks) but it will take longer and there will be a heavy toll on the cars suspension. To be as safe as possible you would also want some experience on driving on broken/ unsurfaced roads and dealing with the challenges of driving in India. Leave Pune on the National Highway 9 (Pune Solapur Highway) which passes the racecourse. This is a toll road and also very busy with cars and trucks. If you have taken a motorcycle be very careful. The turn off to Bhuleshwar is about 35km from Pune and shortly after the second toll booth (about 2km before Yavat village). A concrete bridge crosses a canal and the turn off is to the right just before the bridge. There is no sign in English, but there is a sign to Deccan Industrial Explosives pte. After 5km or so the road will climb into some ghats, where the road becomes quite broken. Once you reach the top of the ghats you will see the temple and a prominent radio mast to the right. The turn to the temple is the next right, the road becomes quite steep at some points. After visiting the temple and fort (allow 30 to 40 mins), return to the road and turn right where you turned off. This road will take you to Saswad (or Sasvad on some maps). There are several turnoffs, keep heading west, but also plenty of people to ask the way, nearly everyone knows Saswad. The scenery is quite flat though enlivened by scenes of Indian rural life. The road is paved but quite rough. You can take lunch when you reach the town. Thereafter, ask the way for Purandar itself or Nasrapur which is where the road goes. Many people know it. The road is the Diwale to Narayanpur road. In fact the hill itself is easy to spot as it towers above Narayanpur. After 5km after the turnoff from you will reach a left fork which is signed (not in English). Take this and follow the twisty road to Purandar. At time of writing (October 09) the majority of the road is totally unsurfaced (awaiting surfacing) so would be muddy during rain and there is also the possibility of dealing with the resurfacing activity. Allow 30 minutes to enjoy the views and look at the abandoned army buildings and another 1.5 hours to climb to the top and explore. It will take about 15 minutes to regain the main ro phone=ad if you have a motorbike. Turn left when you reach it and enjoy the smooth tarmac and twists of the road as you pass between the two hills. Eventually you will reach National highway 4 (also a toll road), turn right and again pay attention to the road hazards. Approximately 12km later at Khed take a left turn towards Shivapur. Pass through towards Kondapur, where you take a right fork, thereafter at the T-junction take the left which leads to Sinhagad Fort. In terms of time to spend here it is best to gauge your stamina and enthusiasm against the amount of light you have left, as it is better to end the journey in daylight rather than drive at night. Retrace your steps to NH4 and then follow this back to Pune. You will arrive in the Bibvewadi area in the south of the city. NilKantheshwar hill is situated near Panshet village. One can visit lord shiva temple on top of the hill. You can see many statues and idols of god on top of hill. Pune is well covered by mobile phone networks. Idea (GSM), Airtel (GSM), BSNL (GSM),Vodafone (GSM), Tata (GSM/CDMA), Reliance (GSM/CDMA), Uninor (GSM),Aircel. To call a Mumbai number, the phone does not require STD. Simply dial 022 followed by the 8 digit number. STD/ISD booths are scattered throughout the city. The fare is calculated on a digital meter and the payment is done after the call. These booths are much cheaper than hotel phones. Plot 19/20, Swajos Complex, Aundh. Ishwarlal Palace, Plot 293/294, Pimpri. Hotel Regency, Dhole Patil Rd. 19/20, Rahul Complex, Paud Rd. 917/2A, FC Rd, Deccan Gymkhana. 1358/A, Shukrawar Peth, Bajirao Rd. Shop 4, Sterling Centre, M.G. Rd, Camp. Pune is by and large a very safe place. Violent crime is low, although it's important to keep an eye on your belongings in public, as petty theft can occur. Do report any such activity to the police. Keep away from the touts. Locals are by and large friendly and mild mannered, though incidents of mugging have been reported on the outskirts of Pune, especially on highways and desolate stretches. If you face a vehicle breakdown after dark, its best to stay in the vehicle and phone for help. Driving in Pune is not for the weak-hearted. Like other Indian metros, Pune has seen a virtual explosion in traffic in recent years, and the infrastructure is struggling to keep pace. Lack of discipline especially during overtaking and driving on the wrong side is rampant in the city and on highways. Its common to see rude and impatient drivers at intersections honking away at pedestrians. Enforcement of traffic rules leaves a lot to be desired, unlike Mumbai or other major cities. Road conditions deteriorate especially in heavy traffic areas during monsoon. According to recent reports, during the year 2012 nearly 407 fatalities in road accidents occurred in Pune, and Speeding and rash and negligent driving are the main reasons for the high number of accidents. If you are driving, its a good idea to drive defensively. Be courteous to fellow motorists and maintain lane discipline. Though the helmet rule is not strictly enforced, its always a good idea to wear a helmet while riding a two wheeler. Neel Kantheshwar - hill based temple near source of our Mutha river. 35 KM from Pune, It is a good hill station with hundreds of statues installed there describing scenes from Hindu scriptures and Puranas. This place also offers you to watch scenes of three major dams from its top, which is very exciting for nature lovers. Mulshi - To the west of Pune lies Munshi, near the town of Lonavala. Mulshi and the surroundings are abundant with natural beauty that includes a dam, the hilly region of Sahyadri's deep forests and forts like Dhangad and Koraigadh. The water from the dam is used for generating electricity.